If you’ve decided to straighten your smile with Invisalign, you are in for a rewarding treatment with minimal sacrifice compared to braces. While Invisalign is known for its high convenience and comfort, you will still need to follow some guidelines to ensure you get the most out of your smile straightening treatment. Don’t neglect your floss. Flossing becomes extremely important when you are undergoing Invisalign. After you brush and put your aligners back in, anything that you didn’t get cleaned out (bacteria, food debris) will remain stuck against your teeth for a long period of time, or until you remove your aligners again. Flossing ensures you are cleaning your teeth as thoroughly as possible before you re-insert the aligners. Don’t stray from your instructions. Your dentist will give you specific rules for your trays, including wearing them as much as possible during the first 48 hours of each set as well as wearing them at least 22 hours a day. You’ll need to be precise about changing them out on time and in the right order. It is a very calculated process that needs to be adhered to for optimal results. Don’t get frustrated with the speech “learning curve”. Your aligners will feel strange at first – this is normal. You may even talk with a lisp for the first days. Instead of getting frustrated and taking your trays out to talk, try to power through and let your mouth adjust to the new appliance. It will get better! Don’t forget to clean your aligners. You may be so anxious to remove your trays to clean your teeth, that you neglect to care for your aligners. 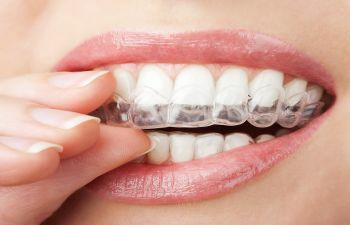 The best way to clean your Invisalign trays is with warm water and antibacterial soap. Don’t use toothpaste to clean your trays; it is too abrasive. Don’t miss out on whitening benefits. While you should hold off on professional teeth whitening treatment until after your Invisalign is complete, now is the perfect time to use a whitening toothpaste. Many patients find that the effects of whitening toothpastes are maximized while wearing Invisalign trays! Don’t dismiss the importance of a retainer. Once your Invisalign is complete and your teeth have shifted into ideal position, you will likely be asked to wear a custom retainer. This phase of your treatment is critical, as it prevents the tendency for your teeth to migrate back to their original position. Neglecting to wear your retainer as instructed could sabotage your entire treatment plan. Want to learn more about Invisalign? Schedule your consult at Gilreath Family Dentistry. We look forward to explaining what this innovative clear aligner therapy is all about and what it can do for you.